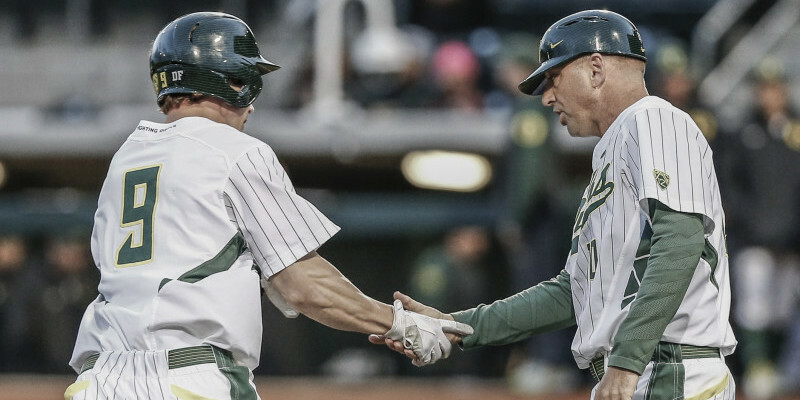 A turbulent season made for quite the ride for Oregon baseball fans and players alike. The Ducks sandwiched mediocre — and at times, poor– play between outstanding performances to open and close the year. In the first month of the season the Ducks went 10-1, outscoring opponents 85-34. Huge offensive numbers against Hawaii and New Mexico State made Oregon appear to be an offensive juggernaut that would be a force to be reckoned with in the powerhouse Pac-12. Success only outside the Pac-12 hurt the Ducks early in the season. However, as they entered March, the challenges became greater and the adversity slowed their performance. Despite winning series against St. John’s and UC Riverside, the Ducks lost precious ground in the Pac-12 race, falling to California, Arizona State and Arizona. Half-way through the season, Oregon appeared to have fallen out of the race until a pivotal series win against Oregon State rejuvenated the Ducks and kept their record above .500 in the month of April. The Ducks swept into the NCAA tournament on the heels of a 12-4 month of May, concluded by handing UCLA their only series loss of the season. Unfortunately for the Ducks, their winning ways were ended by Iowa in the Springfield Regional. After finishing the regular season with four straight one-run games, the Ducks fell to Iowa in Game 1 of the first round 3-1, pitting them against Canisius in an elimination game. Canisius had to play host Missouri State in the morning, and the Ducks were happy to take advantage of the double-header; playing an outstanding game, scoring at least once in all but two innings and knocking the Golden Griffins out of the tournament with a 12-6 win. The Hawkeyes and the Ducks faced off once again in the semi-final following Iowa’s defeat at the hands of Missouri State. 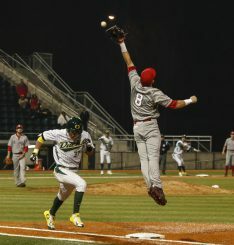 Although the contest was close, it fell just beyond reach, as they watched their season come to a close with a 2-1 loss. Karraker was 1-1 with a 1.29 ERA before a season ending elbow injury. While the 2015 season is now in the books, it is hard to tell what the future holds for George Horton‘s squad in 2016. Jack Karraker is expected to return as a redshirt senior after injuring his elbow early in the season. Cole Irvin will likely be drafted but Horton has said that he believes returning for another season will only help improve his stock. 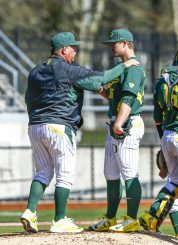 David Peterson led the team with 81 strikeouts as a freshman, falling a single K short of tying Erik Stavert for seventh-most in a season. Add in the return of Matt Krook and the rotation appears to have few holes. Of course, the Ducks are likely to lose some major league talent as well. Steve Mims tweeted that Horton believes the Ducks will lose Mitchell Tolman, Scott Heineman, Josh Graham and Garret Cleavinger to the draft. Tolman had another outstanding season batting .325 with 20 doubles, while leading the team with 42 RBI and 43 runs scored. Heineman was the driving force behind the UCLA series win as he finished the 2015 campaign with a .290 batting average, 4 homeruns and 23 RBI while only starting 45 games. Graham entered the season as a catcher but made his name known on the mound. While going 4-1 with a 2.63 ERA, Graham struck out 64 batters, third behind only Peterson and Cleavinger. Cleavinger has had an outstanding college career in which he holds an 18-4 record, 1.94 ERA, 172 K and 13 saves over his 116 innings pitched. Despite the potential loss of some key components the Ducks are set to return with plenty of talent, and plenty of experience to make another title run in 2016.